A fundraising drive to construct a memorial for a four-legged WWII hero has been launched. 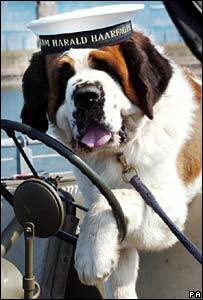 Bamse the St Bernard, who died in 1944, became a local legend during his time stationed in Dundee and Montrose. 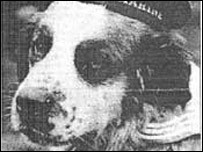 The Norwegian sea dog became a symbol for freedom against Nazism for the allied Norwegian troops. Among Bamse's most famous exploits during his two-year posting was when he saved the life of sailor Lt Cdr Olav Nilsen in Dundee docks. The fundraising drive was publicised when Bamse look-a-like Brit arrived at the docks on Thursday along with the HM frigate Unicorn. The Bamse project aims to raise £50,000 for a larger than life-size statue at Montrose Harbour, which will be created by Midlothian sculptor Alan Herriot. Bamse, who is buried in Montrose, came to the town in 1942 with Royal Norwegian Navy captain Erling Hafto. His reputation grew from his habits in battle while out at sea on his master's ship, the minesweeper Thorodd.